One of the most popular winter events in Aspen, Colorado has once again come and gone, and I missed it. I usually try to take part in some of the activities related to the annual Winterskol celebration in Aspen, but this year I just missed it. I had too much to do myself to afford the time to be a spectator. Well, that’s not completely true because I did watch a fair amount of the NFL football playoffs. I usually prefer to be more active in my endeavors, but this year the playoffs had me hooked – for one thing, the Denver Broncos were in it again. Besides, it was really, really cold outside. I did not, by any means, spend my weekend lounging around on my sofa watching other athletes get their exercise however. I actually scratched a lot of items off of my (way too long) to-do list, and I even managed to get outside quite a bit as well - despite the cold! 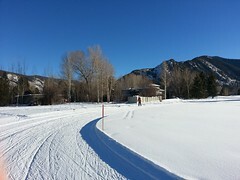 When it finally warmed up to 10 degrees, I ventured out to the Aspen High School and Aspen Golf Course cross-country venues, got some great exercise and thoroughly enjoyed myself. 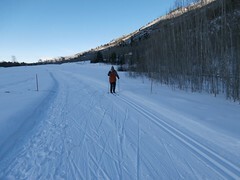 In the end, not even the frigid temperatures, my overwhelming list, the Broncos, or even Winterskol could keep me away from my favorite Aspen winter activity – cross-country skiing.